OEHLBACH JUMP 5005. PONTICELLI PER BI-WIRING. PONTICELLI CON CAVO VAN DEN HUL CS 12 HF. SET DI 4 PONTICELLI BI WIRING. LUNGHEZZA 12 cm da gola a gola delle forcelle. mi scuso ma quando avevo visto i cavi non avevo capito, perchè sulle tue foto su internet mi sembravano diversi. SET DI 4 PONTICELLI BI WIRING. con un colore molto piu' nitido e gli effetti sul suono sono palesi. Non si fornisce fattura con IVA separata. Vendo due coppie di ponticelli originali per diffusori Avalon. PONTICELLI PER DIFFUSORI ACUSTICI HI-END. Un processo lungo e minuzioso, per non lasciare niente al caso e ottenere sempre un prodotto perfetto in ogni suo aspetto. This product did not want to leave anything to chance, because it's the details that make the difference. The cable used is the famous high quality KIMBER KABLE 4TC. The cable is pre-used but in excellent condition. Spade and banana connectors are new. Spades have 8mm jaw opening. By installing this set of 4 jumper cables you could improve your listening pleasure in seconds. QED has won moreWhat Hi-fi?. Its 2.5mm² cross-sectional area makes it ideal for longer runs. QED XT25 has a large current carrying capacity as it’s made up of99.999% oxygen-free copper. QED Award Winning Cables. Spades have 8mm jaw opening. The cable used is the renowned high quality CHORD ODYSSEY. Are you using single wire speaker cable with bi-wireable speakers?. By installing this set of 4 jumper cables you could improve your listening pleasure in seconds. For a quick and effective upgrade to your bi-wirable speakers simply remove the standard connectors bare rails and affix ours for instant Qed. The QED other Bi-Wire Link (Speaker Jumpers Cables). The QED Analogue Interconnects. Airloc Forte ABS Plugs. Gold-plated AIRLOC Forte banana plugs and/or spades fitted. Jumper Links 20cm long including Airloc covers. QED Award Winning Cables. QED Silver Anniversary XT Jumper Links. QED Silver Anniversary XT jumper links will improve the performance of your speakers when replacing manufacturers' standard speaker links. AIRLOC Forte Plugs/Spades. On request, wide fitting Airloc spades can be fitted10mm wide gap between forks. Award Winning Cables from QED. What Hi-Fi?. QED technology from Genesis and X-Tube cables. If these conductors are arranged around a hollow central core of polyethylene the self inductance exhibited by the cable can be reduced to around half that predicted by calculation. AIRLOC Forte Plugs/Spades. On request, wide fitting Airloc spades can be fitted 10mm wide gap between forks. QED Reference XT40. "The QED XT40 is a special cable – detailed, balanced and authoritative, and we think it’s worth every penny. NAIM recente adesione A5 Bianco Altoparlante Cavo jumper-links (Set di due oratori). 22cm A Pair (stereo speakers) of Naim NAC A5 Audio HI-FI Bi-Wire Link (Speaker Jumpers Cables). For a quick and effective upgrade to your bi-wirable speakers simply remove the standard connectors bare rails and affix ours for instant Naim. Spades have 8mm jaw opening. The cable used is the renowned high quality CHORD ODYSSEY. Are you using single wire speaker cable with bi-wireable speakers?. Ecosse Reference SMS2.4 Speaker Cables 6m pair, With Matching Bi-Wire Jumper Links. Note that there is a small section of heatshrink I have added close to the speaker banana connector - this was due to a small graze of the insulation only, the wire itself has not been affected. The brass jumper bars supplied by speaker manufacturers have low conductivity and are inadequate for proper signal transfer. Gold Spades. BI-WIRE JUMPER. Conductors: 12 awg Silver Coated Continuous CrystalTM Copper. Naim NAC A5 Altoparlante Nero Cavi Jumper-link x4 (Set di due altoparlanti). 4x 18cm (Set of two stereo speakers). Naim NAC A5 Audio HI-FI Bi-Wire Link (Speaker Jumpers Cables). For a quick and effective upgrade to your bi-wirable speakers simply remove the standard connectors bare rails and affix ours for instant Naim. 4 x 20cm (Set of two Stereo Speakers) QED X-TUBE XT-40 Speakers Jumper Cables. For a quick and effective upgrade to your bi-wirable speakers simply remove the standard connectors bare rails and affix ours for instant Qed. Chord Epic speaker cable is the result of a happy marriage between two of our award winning speaker cables. Violins, cellos and violas sound more realistic, likewise pianos, bass notes have great definition and rhythms are easy to follow and get involved with. So what do I do with these jumper cables. • Conductor stranding of one each jumper: 2x227 x 0.15mm. LSV Cables. The ends finished with colour coded black & red heat shrinks. The information will be retained for order processing and further communication purposes. Cardas Custom Adaptors & Cable. 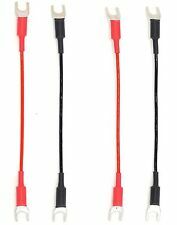 Cardas Speaker Jumper Cables with Rhodium Spades (Set of 4). Headphone Amplifiers. Speaker Stands and Supports. Replace the poor quality gold plated brass jumpers on your bi-wired speakers with these custom-madeCardas Jumper Cables for a big upgrade to virtually every aspect of your speaker's performance. For a quick and effective upgrade to your bi-wirable speakers simply remove the standard connectors bare rails and affix ours for instant Chord. • The Chord other Bi-Wire Link (Speaker Jumper Cables). This Bi-Wire Jumper links is part of the Shawline cable range which includes loudspeaker cable and digital and analogue interconnects. Shawline cables have been designed to perform together. However, all Chord interconnects and speaker cables follow a similar design philosophy. NUOVO Kimber 8 PR altoparlanti Bi-Wire CAVI ELETTRICI x4 (Set di 2 altoparlanti). 4 x 22cm length (Set of 2 Stereo Speakers) KIMBER 8 PR Bi-Wire Speakers Jumper Cables. For a quick and effective upgrade to your bi-wirable speakers simply remove the standard connectors bare rails and affix ours for instant Kimber. For a quick and effective upgrade to your bi-wirable speakers simply remove the standard connectors bare rails and affix ours for instant Qed. • The QED other Bi-Wire Link (Speaker Jumpers Cables). • The QED Analogue Interconnects. The Sarum Speaker Links Jumper Cables from Chord are more than just the final link for a Sarum equipped system. Headphone Amplifiers. Atlas Speaker Jumper Cables. Speaker Stands and Supports. Nordost & Wyrewizard Cables. Speaker Cables. Ethernet Cables. HDMI Cables. Mains Cables. NUOVO tellurio Q Ultra Blu ALTOPARLANTI CAVI jumper-links (Set di due oratori). So what do I do with these jumper cables?. One end high quality 24 gold-plated spade connectors, other end high quality 24 gold-plated banana plugs Z-Type with extra crimped pin sections (Crimp sleeves). We have took the difficult path to create multi wire or Cat 5 formation jumper cable that clears away the fade between you the listener and musicians performing in favouite recordings. For a quick and effective upgrade to your bi-wirable speakers simply remove the standard connectors bare rails and affix ours for instant Chord. The Carnival Silver Screen speaker cable uses designs inspired by Chord's high end Signature cable. Graham Slee Cusat50 Audio RCA Interconnect 2.0m. Graham Slee Bitzie USB DAC Digital to Analogue Converter. Headphone Amplifiers. Speaker Stands and Supports. Speaker Cables. Pro-Ject (Project) Anti-Skate Bias Weight (with thread) marcy101274(211). NUOVO Chord Company Odyssey 2 ALTOPARLANTI CAVI A PONTICELLO-collegamenti (Set di due altoparlanti). Chord Odyssey speaker cable shares its principal design features with Chord Rumour. Like Rumour, each conductor is made up of 19 strands of silver-plated oxygen free copper surrounded by Teflon insulation. 4 x 20cm (Set of Two Stereo Speakers) QED Ruby Anniversary Evolution Speaker Jumper Cables. For a quick and effective upgrade to your bi-wirable speakers simply remove the standard connectors bare rails and affix ours for instant Qed. And what I else heard by testing Carnival Silverscreen and Clearway?., October 2015. High-performance shielding is specified and just like the award-winning Carnival SilverScreen, Chord Clearway speaker cable features two contra-wound high-density foil shields. Van Den Hul Speaker Cables also available. For a quick and effective upgrade to your bi-wirable speakers simply remove the standard connectors bare rails and affix ours for instant VDH. The TWIN is an entry level twin-lead AWG 16 loudspeaker cable with a good sonic quality despite its friendly price. QED cable with vintage copper spades and gold plated banana Z plug, Two pair of 18cm. jumpers. post from sourced area. 4 x 20cm ( 2 pairs Set of two Speakers ) Van Den Hul ClearWater HI-FI Bi-Wire Link (Speaker Jumpers Cables). LSV Cables. One end high quality 24 gold-plated spade connectors, other end high quality 24 gold-plated banana plugs Z-Type with extra crimped pins section (see photos), and all ends finished with colour coded Red & Black heat shrinks. So what do I do with these jumper cables?. LSV Cables. This hi-fi Bi-Wire Link (Speaker Jumpers Cables) is designed for high-end hi-fi systems and for critical studio monitoring applications where transparency of signal transmission is paramount. 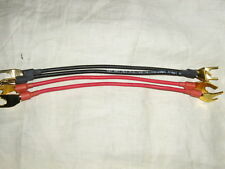 The cable used is the renowned high quality QED XTC. If you would like a different combination of spades and bananas, just ask! Spades have 8mm jaw opening. Are you using single wire speaker cable with bi-wireable speakers?. Van Den Hul Speaker Cables also available. For a quick and effective upgrade to your bi-wirable speakers simply remove the standard connectors bare rails and affix ours for instant VDH. The SKYLINE HYBRID is an elegant small twin conductor loudspeaker cable with outstanding qualities. 20cm (A Pair) TALK3 SPEAKER JUMPER Cables. For a quick and effective upgrade to your bi-wirable speakers simply remove the standard connectors bare rails and affix ours for instant Talk3. So what do I do with these jumper cables?. 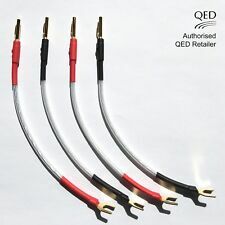 4 x 20cm Set of QED Ruby Anniversary Evolution Speakers Jumper Cables. For a quick and effective upgrade to your bi-wirable speakers simply remove the standard connectors bare rails and affix ours for instant Qed. NEW KIMBER 8 PR SPEAKERS BI-WIRE JUMPER CABLES x4 (Set of 2 Speakers).